2. What Does It Mean to "Own" Your Education? 10. Does Class Attendance Matter? 18. Are 8am Classes Better? 10 Does Class Attendance Matter? 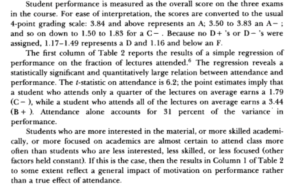 I believe attendance definitely matters in college courses. From student to student attendance is a very important part of your education. If you do not attend class you will miss day-to-day work and homework. You will end up having to teach yourself everything that the teacher teaches in class. Think about it: the point of you going to class is to learn from your professor. As a student you are paying thousands of dollars per year to go to class so why would you even want to skip? I understand if you miss a class here or there because you aren’t feeling well or had a rough night with an early morning class, it is college. Either way that should be a rare excuse for you missing a class. Professors should give you a certain amount of unexcused absences before you start to get penalized for it. For example I have one professor now that every time you miss a class you lose points towards your final grade. The professors should be pretty lenient about that they went through college as well. But you as the student should be aware of the expense and benefit of attending class. The professor should allow students to come in late to class as well because they are the ones paying for their education. If they are late it is their loss for missing lessons. Everybody should try to make every class they can. I understand the rare occurrence of having to miss but don’t miss out on a great opportunity of learning something new every class. As seen in the image, a study by The Journal of Economic Perspectives and written by David Romer talks about attending class relative to grades. David Romer writes, “A student who attends only a quarter of the classes averages a 1.79 (C-) in the course while a student who attends all lectures on average earns a 3.44 (B+)” (Romer 171). This just goes to show you learn much more by attending class. If you don’t attend class and don’t do well in school it will be harder for you in the long run by creating bad habits and making it harder for you to find a job. So research pretty much says go to class to succeed in college! OpenSem: A Student-Generated Handbook for the First Year of College by Jacob McMaster is licensed under a Creative Commons Attribution 4.0 International License, except where otherwise noted.